Still you've yet to wear out at all, you must have super powers. not a crack, rip or tear. So absolutely soft and light, you're like walking on air. I love you so much, in fact, I bought another pair! I made the poem up while cooking dinner, thought it was funny. If these are available where you live, I urge, nay, implore you to buy a pair. I think I've said enough but they are the most comfortable thing I've ever put on my feet, and so durable. Everything gets so worn out so easily here. I'm not crazy about the smileys on the silver pair but they wont show when I'm wearing them anyway. Hahaha, Mona, you cracked me up, lol! 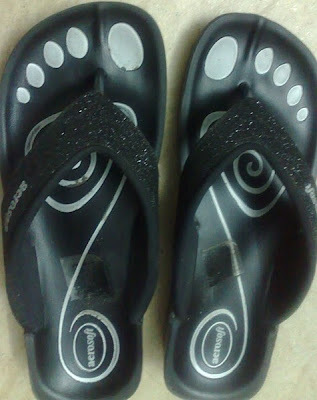 The interesting this is that I happened to buy some aerosoft sandals 2 days ago from Mahmal...and was eyeing their selection of cutie slippers, debating whether or not to rack up right now for summer or just wait til next season...I ended up getting the sandals only, but seeing as how comfy they are (and they are REALLY comfy mashaa Allaah) I'm thinking I'm gonna go back inshaa Allaah and get a couple pair for next summer. I say next summer because I usually have to wear socks in the winter and thong slippers with socks is like, soooo annoying to me, lol! Haha I like this because I'm the opposite. I HATE flip flops! And whenever someone has flip flops in my house I hide them in the cupboard so I can't see them. I looooove sandals and comfy ones? Yes! I'll look for these here now that I've got 2 good recommendations. I wish I lived in a hot country though! I would never have the need for boots, just flats and flip flops!! Asiya, I wear them year round plus at home :)Actually, when I do my daily walking,my sneakers gave me blisters and the slippers without socks hurt my feet cause sand would get in between but now I walk with socks and the black flip flops and I look dorky but I'm comfortable, and I don't care! Umm Aaminah, I got the second pair because I was worried that once/if these finally wear out I won't be able to find them! and sometimes i use flip flops to go get something from the parking lot or at the grocery store. but i'm not THAT in love with them to use them when i go out to the mall. maybe cos i have too many sandals already and hubby is already complaining i have too many shoes/sandals but don't seem to wear most of them!! mona, you're a baaaaad influence on me girl. i always seem to want to go shopping after reading about your stuff. hahahahhahahahahaha. I wear my sandals around the house too, that's why I bought them. Everyone loves them, even the kids...Rahmah's begging me to buy her a pair, lol! About flip flops and socks, I don't know, maybe because I have big feet but my feet are just not comfortable wearing normal socks with flip flops. I think if I got some of those neat five-toe socks, then I could probably pull of wearing flip flops with socks, lol! Asiya, Yea I have to pull the socks up a little to have room but I'm used to it. Batates_777, They really are so easy and comfy. I have the exact same ones and I love them!